The Corkman made Paralympic history this week. THE BASEBALL CAP backwards, the green shades and the chiselled physique of a man half his age, Pat O’Leary belongs at this level. As he strapped his left leg back on and docked by the pontoon, the gold medallist — Serhii Yemelianov of Ukraine — made a point of stopping by and having a word. “You’re strong, very strong,” he remarked, followed by a congratulatory pat on the back. 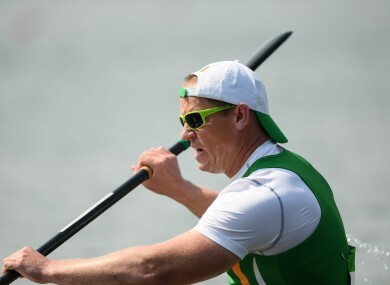 O’Leary, the NUIG lecturer who had his leg amputated after battling bone cancer, had just finished sixth in the Paralympic KL3 canoe sprint final. He crossed the line a little under three seconds behind the winner. After progressing through yesterday’s heat and semi-final, O’Leary found himself in an elite field for the medal race but more than held his own on the biggest stage. “You obviously go in hoping against hope but looking at the performance of the three guys that medalled it would have taken an awful lot to beat them,” he admitted. He started strongly but faded after the halfway mark as Yemelianov, Germany’s Tom Kierey and home favourite Caio Ribeiro de Carvalho pulled away to enter a battle for gold. In the immediate aftermath, O’Leary sat at the bottom of Rio’s stunning Lagoa Stadium and let it all sink in. With ten family members, including his wife and two sons, in the stands, the significance of the occasion, and achievement, wasn’t lost on him. “When I got back in the boat after my operation all I wanted to do was be able to paddle,” he said. “After six months I wanted to compete. I went to Nottingham and raced the Great Britain guys and that went well. To get to this point has required an unimaginable amount of resolve, hard work and sacrifice. Only O’Leary, his wife and two young boys could ever appreciate the journey they’ve been on. Five years ago, he had to make the unspeakable decision to give a surgeon permission to amputate his leg. Just before he did his Leaving Cert, O’Leary was diagnosed with cancer behind his kneecap and two decades later, complications arose with his prosthetic knee. “It’s hard to know if I feel I truly belong at this level now,” he continued. “It’s an explosive sport so you can go that bit longer. The German guy (who won silver) when we were here for the test event, I celebrated his 21st birthday with him. At which stage I was 42 so it puts it in perspective. Getting to Rio was O’Leary’s ultimate goal and it was perhaps fitting that, with Christ the Redeemer perched upon the Corcovado mountain, looking over the most idyllic of venues, that it was here he would find his own salvation. But he couldn’t have done any of it without the support of his family, colleagues in Galway and the communities of Moycullen and Courtmacsherry. “I came off the water yesterday, we have a Whatsapp group ‘Updates on Pat’ and there were 248 updates on it. I didn’t get through them all but I will,” he explained. Email “'If what I am is sixth in the world, then how bad is that? ': O'Leary proud of Rio journey”. Feedback on “'If what I am is sixth in the world, then how bad is that? ': O'Leary proud of Rio journey”.